Today, let’s make a lei, wear a lei, give a lei! 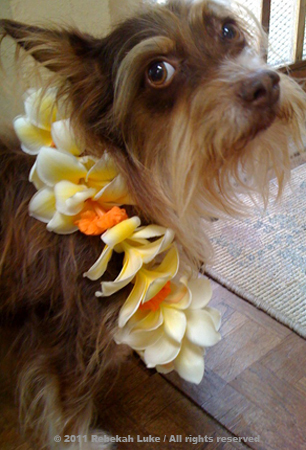 May Day is Lei Day in Hawaii! This lei is strung kui style with yellow plumeria and orange kou blossoms from the garden. Aloha to you. If you are new to Rebekah’s Studio, here’s my 2010 Lei Day entry. This year’s celebration at Kapiolani Park Bandstand—the 84th annual— runs until 5:30 p.m. today.